Is Capital One Financial Corp. (NYSE:COF) going to take off soon? The smart money is getting less optimistic. The number of bullish hedge fund positions were cut by 3 lately. Our calculations also showed that COF isn’t among the 30 most popular stocks among hedge funds. COF was in 44 hedge funds’ portfolios at the end of the fourth quarter of 2018. 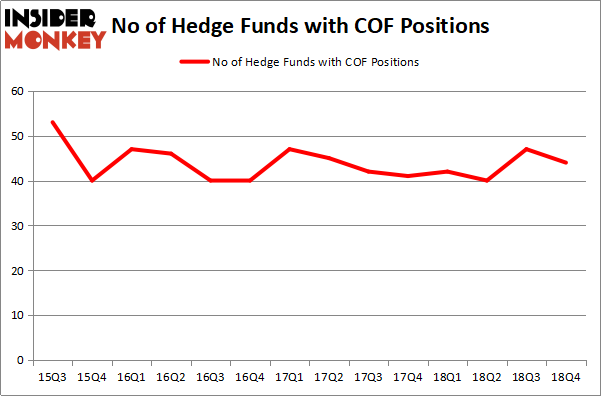 There were 47 hedge funds in our database with COF holdings at the end of the previous quarter. We’re going to take a glance at the new hedge fund action surrounding Capital One Financial Corp. (NYSE:COF). How are hedge funds trading Capital One Financial Corp. (NYSE:COF)? At the end of the fourth quarter, a total of 44 of the hedge funds tracked by Insider Monkey held long positions in this stock, a change of -6% from the previous quarter. On the other hand, there were a total of 42 hedge funds with a bullish position in COF a year ago. So, let’s check out which hedge funds were among the top holders of the stock and which hedge funds were making big moves. 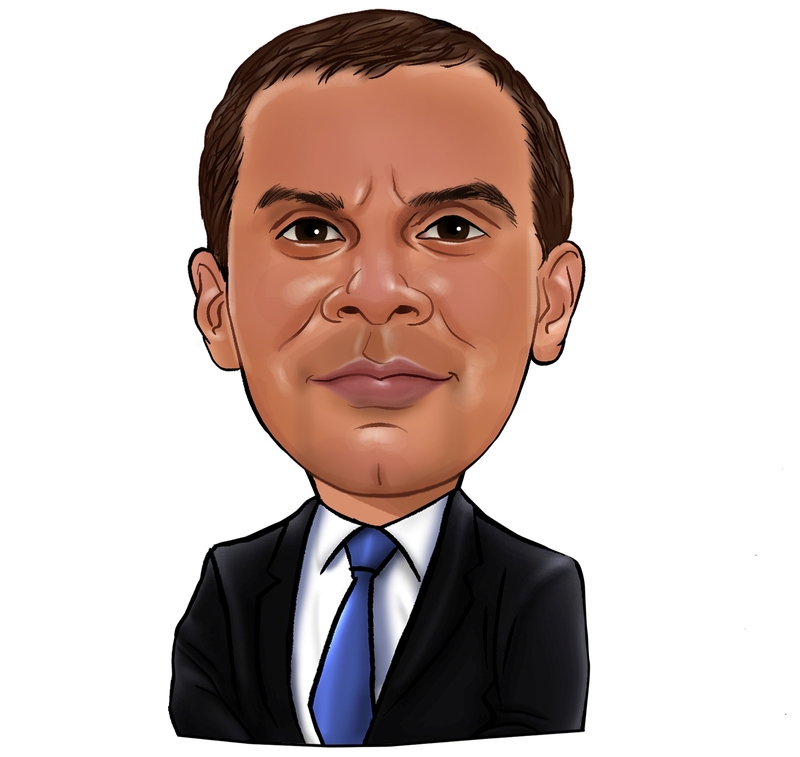 According to Insider Monkey’s hedge fund database, Pzena Investment Management, managed by Richard S. Pzena, holds the number one position in Capital One Financial Corp. (NYSE:COF). Pzena Investment Management has a $437 million position in the stock, comprising 2.6% of its 13F portfolio. The second largest stake is held by GLG Partners, managed by Noam Gottesman, which holds a $177.8 million position; the fund has 0.8% of its 13F portfolio invested in the stock. Some other members of the smart money that hold long positions include Israel Englander’s Millennium Management, Steve Cohen’s Point72 Asset Management and Peter Rathjens, Bruce Clarke and John Campbell’s Arrowstreet Capital. Because Capital One Financial Corp. (NYSE:COF) has witnessed declining sentiment from the entirety of the hedge funds we track, logic holds that there were a few money managers that slashed their entire stakes heading into Q3. Interestingly, Benjamin A. Smith’s Laurion Capital Management said goodbye to the biggest stake of the 700 funds tracked by Insider Monkey, comprising an estimated $19.3 million in stock, and Bain Capital’s Brookside Capital was right behind this move, as the fund cut about $11.9 million worth. These moves are interesting, as aggregate hedge fund interest fell by 3 funds heading into Q3. Let’s also examine hedge fund activity in other stocks – not necessarily in the same industry as Capital One Financial Corp. (NYSE:COF) but similarly valued. These stocks are Carnival Corporation (NYSE:CCL), Micron Technology, Inc. (NASDAQ:MU), Activision Blizzard, Inc. (NASDAQ:ATVI), and BCE Inc. (NYSE:BCE). This group of stocks’ market values match COF’s market value. As you can see these stocks had an average of 43.75 hedge funds with bullish positions and the average amount invested in these stocks was $1667 million. That figure was $1858 million in COF’s case. Micron Technology, Inc. (NASDAQ:MU) is the most popular stock in this table. On the other hand BCE Inc. (NYSE:BCE) is the least popular one with only 16 bullish hedge fund positions. Capital One Financial Corp. (NYSE:COF) is not the most popular stock in this group but hedge fund interest is still above average. This is a slightly positive signal but we’d rather spend our time researching stocks that hedge funds are piling on. Our calculations showed that top 15 most popular stocks among hedge funds returned 19.7% through March 15th and outperformed the S&P 500 ETF (SPY) by 6.6 percentage points. Unfortunately COF wasn’t in this group. Hedge funds that bet on COF were disappointed as the stock returned 12.1% and underperformed the market. If you are interested in investing in large cap stocks, you should check out the top 15 hedge fund stocks as 13 of these outperformed the market. Were Hedge Funds Right About Ecolab Inc. (ECL)? Is Illinois Tool Works Inc. (ITW) A Good Stock To Buy? Were Hedge Funds Right About Getting Into Bank of Montreal (BMO)? Were Hedge Funds Right About Dumping FedEx Corporation (FDX)? Is Vertex Pharmaceuticals Incorporated (VRTX) A Good Stock To Buy? Were Hedge Funds Right About Selling Northrop Grumman Corporation (NOC)?